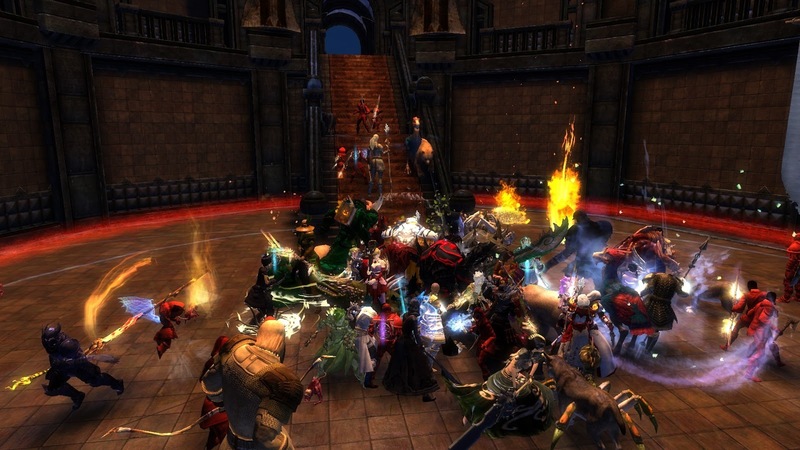 Just shy of a year after launch Guild Wars 2 looks to be in good shape commercially. NCSoft's quarterly report in May described both box sales and microtransactions as "still very strong". The Nosy Gamer's invaluable if controversial Digital Dozen consistently shows GW2 second only to World of Warcraft in XFire logins. 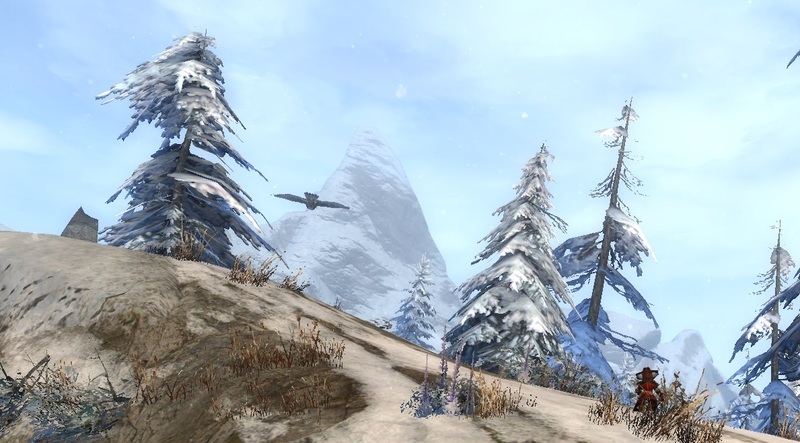 Anecdotally from my own observation in-game I'd say Yak's Bend has rarely been busier, with plenty of new players asking new player type questions in map chat and many familiar names I haven't seen for a while not just reappearing but sticking around. 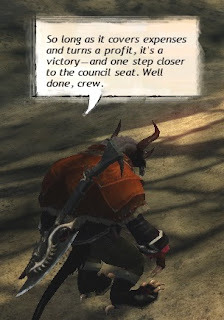 That popularity, however, doesn't seem to be mirrored by the GW2 bloggers and commenters I read. Some have dropped out altogether while others still post but frequently grumble (guilty as charged). That might be just the insular nature of the little pond we all swim in, though. 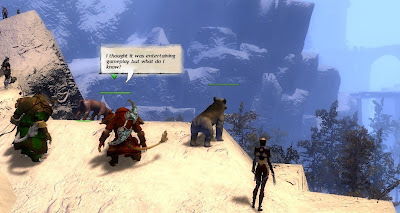 I took the trouble to click through Hunter's GW2 blogroll this morning, which is a list of blogs most of which I've never read or even heard. Some of them are shuttered or haven't posted for months but quite a few have posted recently in pretty positive tone. "...with multiple teams producing thematically connected stories in short development cycles, it's often stressful. But now that we've gone through the motions a number of times, it's getting a little easier to manage." Ironic understatement. Always one of my favorites. So are you managing it or aren't you? If not, when do you think you might get on top of things? "To put it into perspective, our first two Living World releases, Flame & Frost: Prelude and Flame & Frost: The Gathering Storm, had extremely short development cycles. The common misperception about these two releases is that there was supposed to be a huge narrative component to them when in reality they were meant to provide context for upcoming releases which would have much more gameplay and story. In essence, we were rolling out the Living World story in small phases while our tech and design were being solidified." Testing in a live environment with players as the test subjects, in other words. I don't object in principle. I played five years on EQ2's Test server after all, but it had a population in double figures for most of that time. Paying players generally do not choose to play in unstable environments. But then, we're not paying, are we? "I’m happy to say that our latest designs will go a long way in solving many of the usability and contextual issues that players are facing when trying to experience the Living World story." I like the use of the future tense there and the flurry of adjectives and descriptive phrases setting limits on what might be achieved. Let's not over-promise or over-commit, eh? Still, Syp should be happy to hear a fix is incoming for at least some of the problems he so eloquently highlighted. "We've had to rethink our methods of story delivery post-ship...I was not directly involved with the core Guild Wars 2 story, so I wasn’t privy to all the decisions and ideas that formed the final product at ship...Now that my team is actively writing story content, I’ve worked with people in various departments about the ways in which we present story to our players. We no longer use cinematic conversations for exposition." I'm in charge now. All that stuff those other guys spent five years on? Dust in the wind. Although I tend to agree that those puppet-show cinematics never worked and no-one's going to miss them, it does make me wonder what else from the ancien regime may now have become that of which we no longer speak. "world dynamic events are very good at conveying and reinforcing themes, but aren’t necessarily great for character development. They’re non-linear by nature in that they run independently of player progression within a linear story path..."
If you give people toys sometimes they don't play with them the way they're supposed to. For god's sake, sometimes they just kick the ball about and don't even keep score! "Our players want to be entertained. If a story resonates with them, they’ll appreciate it. If it’s poorly executed or gets in the way of their adventuring and exploring, then they’ll have something to say about it. But story and characters provide the player with context and without them, the game is reduced to its core mechanics." Fine. Only first off, much of The Living Story has been poorly executed and secondly, context is Background while the mechanics you're introducing are Foreground. Our adventuring and exploring trumps your narrative. Always. Or it should do. 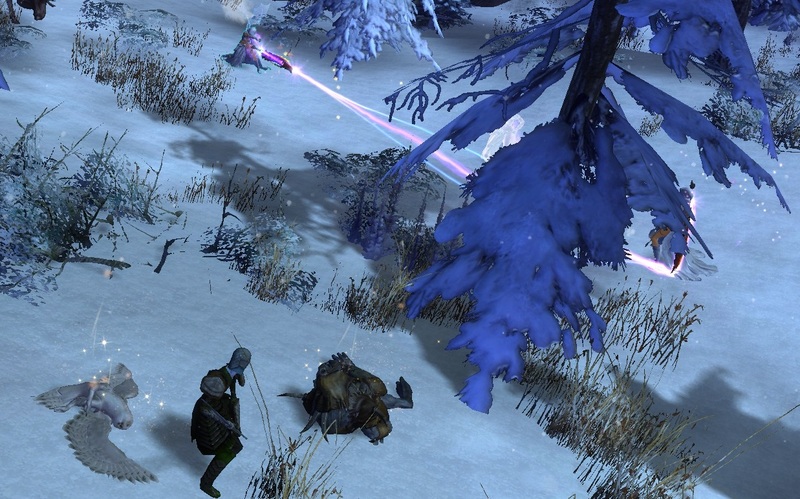 "We didn’t build a living game world just so people could kill virtual monsters. It’s there so they can live out their heroic fantasies, go on thrilling adventures with their friends, experience unusual situations, and do things that they can only dream of in real life." Well I certainly can't vote over a hundred times for the same candidate in the same election in real life, I'll give you that. Not if I want to stay out of jail. "Players will soon understand where these characters are headed, and how these seemingly disjointed events fit together and tie into the larger narrative. So while it may look like we’re playing catch-up, we’re actually ahead. It’s just hard for the average player to make sense of it all since we’re pacing it out in two-week increments and we don’t yet have a mechanism to log what’s past and what’s to come. That’s slated to change before the end of the year." "Any team that has to support a live game is under a lot of pressure to produce great content. We’re certainly feeling it since we absolutely must ship something every two weeks"
"It’s sometimes hard to process complaints that each semi-monthly release isn’t a full-blown expansion." What more do you want? Blood?! If I find out who said "Expansion" and "Living Story" in the same sentence, then you'll see blood! "What we can do is look at what players are doing, analyze those metrics, and make informed decisions so that we’re providing them with more of what they like and less of what they don’t." No! Seriously, NO! What you're doing is providing us with more of what we're doing, not more of what we like doing. It's not the same thing. Much though I personally disliked the Super Adventure Box, it was possibly the most popular single addition to the game ever. None of us had any idea it was coming. One of your people decided it would be worth doing and he did it and he was right. We need you to make new things, things we don't know we want yet, not just replicate more and more of the exact same stuff you can see us doing already. "we don’t have the luxury of huge budgets and flexible release dates that we had before launch. In short, we’re forced to be more creative with less resources"
Not much has changed since February, then. I won't hold my breath for a new WvW map. "Once our Living World tracking system is online, we will have solved the story presentation issues that are currently making it difficult for people to experience the story content in the proper order...In the long term, we’ll have a system to better support the Living World narrative." Yes, end of the year. You said that already. Until then we'll just kill all the things, tick all the boxes, grab all the loot and forget about the story. You know that's what we're going to do anyway so there's really no hurry. "Players will soon experience events in the Living World story that will tie things together in a way that is more relevant to their character. We also intend to provide a mechanism that will help players more easily find and experience the story content, though I can’t provide a specific release date for that feature." Not the end of the year this time, then? That's too specific, is it? Soon come, as Peter Tosh would have said. "I think it takes a lot of guts to comb through thousands of critical (and at times, somewhat snarky) posts about why a total stranger hates what you’ve spent years crafting." I think if you're getting "thousands" of posts that say they "hate" what you've crafted you might want to consider the possibility of crafting something different next time, rather than crafting the same thing again and painting it a different color. Is that enough snark? Taking my snark hat off (I kill and skin the snarks myself, I'll have you know, although I have a little man that makes them into hats for me) Bobby Stein comes over pretty well in the full interview. I'm sure he's doing the best he can. It must be a nightmare of a job, under-resourced, on a frenetic schedule, juggling the demands and competences of four separate teams. I bet he wishes he was working on a nice, behind-closed-doors, full NDA, done-when-it's-done Expansion instead. I wish he was, too. Liore just posted this at Herding Cats. I'd never heard of Pronunciation Book. If this really is the culmination of something that was set up three years ago, all I can say is internet, your job is done. Sixty-six is my favorite so far, possibly because it reminds me of Lana del Rey's ten-minute version of Ride, but every one is a gem. I'm going to listen to the entire three years' worth from the start and see if I can spot any foreshadowing. Comments are gold. Is that Morse Code? No, it's static. Nothing to do with MMOs? Three words. The Secret World. 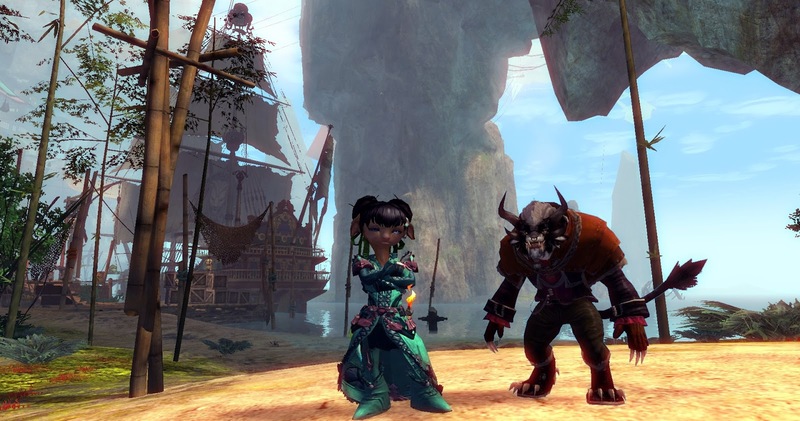 Passing grade on the current Guild Wars 2 assignment is sixty per cent. A couple of the papers are gimmes. 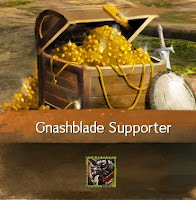 Pop a support token in the voting basket, that's one. Finish your dailies three times with the colors of your candidate flying, that's two. Peasy. Did those ages ago. Then there are a couple almost as simple that just take a bit longer; twenty events in your candidate's homeland with the button up and fifteen rounds of Southsun Survival. Ooh, that second one sounds scary! It does, doesn't it? Well it's not, because you don't need to win, or even try. Doesn't matter if you come dead last every time. You just have to be there at the end, fifteen times. Anyone can do that, even if they hate PvP. Four down. Need two more. If you like Dungeons there's another gimme. Finish any one dungeon with the button on. If you like Fractals, same thing, except it has to be the Jade Maw. (Don't look at me, I never even heard of it). Master Marksman for one. Shoot ten people in the head. That's another Southsun Survival one. Surprisingly easy so long as you don't mind PvP. I did that. Enjoyed it too. Shot a few more people than I probably needed to, as it happens. Don't judge me. That's seven. Three left. The hard ones. There's one that's hard 'cos it takes ages and two that are hard 'cos they're hard. The slow one is getting two and a half thousand points at Southsun Survival. I could do that but I reckon it would take me about 70-75 rounds, which, even if no-one tries to win by hiding, is something like ten hours. I got 530 points from fifteen goes. Best score was 60. Came second that time, using my secret strategy (that I adapted from Jeromai's. Alright, it's basically same as his only with more Karka). After the first couple of runs, when I was still trying to win and came last or thereabouts with two points if I was lucky, I changed to that tactic and from then on I averaged forty to sixty points a go. Still going to take way too long to get 2500, though, so forget that one. Okay, so I ruled out dungeons, fractals and point accumulation and ruled in headshots. Got five. Need one more. Not much choice. None, in fact. The last two are Direct Support and Advanced Support and you can't do Advanced until you've done Direct, so Direct Support it is. And what is it? It's stopping a lot of filthy pirates stealing Gnasher's hard-stolen-won plunder, that's what it is. Jeromai (yes, him again) has masses of detail about how it works. He could also do it. And the Advanced. Probably while whistling "Yes We Have No Bananas" in two-part harmony. I couldn't. I could do part one alright. Did it first time, never even knew what I was doing. Just followed Gnasher's lackey to the piles of loot we were protecting and killed everything that ran at us. Didn't even realize they were trying to steal the treasure - I thought they were trying to kill us. Which they were, although only incidentally. Got silver on that, first time: Direct Support 1/2. So we "upped it a notch" That what the woman called it. More like twenty notches. Tried it with a ranger. Died. Tried it with the other ranger, the one that uses traps. Lived, but lost. Snares, roots, knockbacks, spikes, no good. Same thing every time. Too many plunderers, too few of me. I need someone who can be in two places at once. Enter the Engineer. He gave it a great shot. Turrets at both plunderer spawns and him playing catcher inbetween. Best run, 500 plunder left and 3 seconds to go, but by then I swear there were four plunderers in play (for a fact, three) and one got home. Only one class left on this account. Cometh the hour, cometh the necromancer. First run's close, but all the runs are close. Close does not get you the cigar. Or the Achievement. If this doesn't work it'll be time to drag Mrs Bhagpuss away from Tinkerfest. No, come on, you can do it. Yes I can, too! Maybe it's a slight change of tactic. - kill more things. Maybe it's just luck. Maybe necros are just badass. Five hundred in the pot as the clock ticks the last few seconds and look! Not a plunderer alive! The little necro scrapes home and Gnasher's so happy he breaks off a bit of himself and gives it to her. That's how she sees it anyway. Necros are like that. 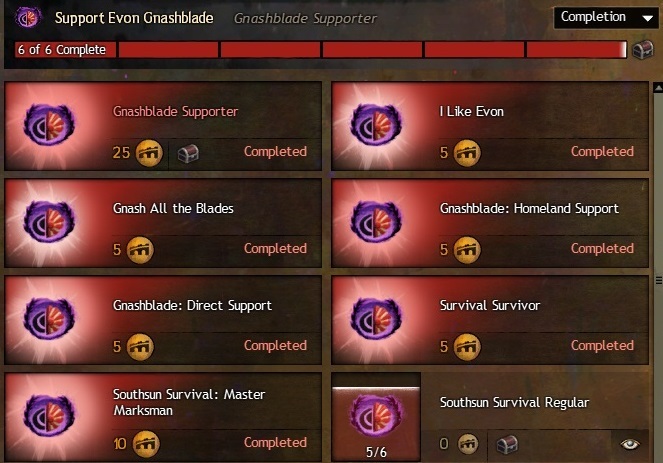 All that for an Evon Gnashblade mini. It's the biggest mini I've ever seen, mind you. It's literally taller than she is. Still, I don't collect minis. I can't keep them in the bag five minutes before I've sent them back to the bank by mistake so what's the point? Why did I start this in the first place? Syp's joined the doubters. He's not having fun. I am, though and that's the problem. I'm doing things I don't want to do for reasons I can't explain to get rewards I don't want to have and I'm enjoying it. Last night I went exploring in New Eden. Okay, that's confusing already. Why did Red5 choose the same name for the setting of Firefall that CCP have been using for the EVE universe for the last decade and more? Beats me. Anyway, it was Firefall I was playing. Internet spaceships don't really do it for me. Internet jet-packs, however, have been one of my favorite things since I first crash-landed on a treetop in Endless Ages back at the start of the twenty-first century. Internet motorbikes aren't too shabby either. Firefall has both. 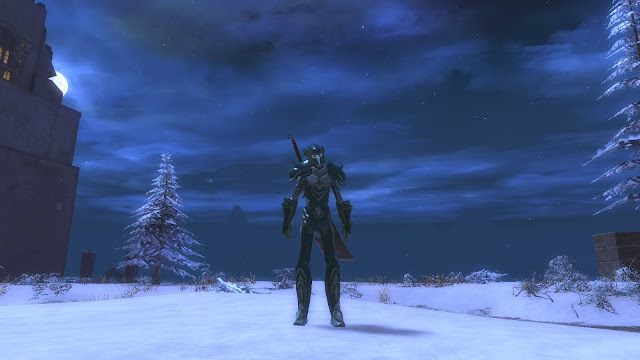 It also has what must be one of the longest day/night cycles I've ever seen in an MMO and nighttime gets really dark. Pitch, if you happen to be in jungle, of which there is plenty. There's also a severe shortage of roads, and my bike is a loaner, which makes hopping across the landscape like a broken-winged sparrow in a hurricane my preferred method of transport for now. Firefall exemplifies much of what's needed to satisfy the explorer archetype. The world is extensive, geographically complex, rich and detailed in both sight and sound and sufficiently intriguing to invite and reward investigation for it's own sake. The controls for movement are fluid and intuitive, very easy to learn while requiring a satisfying degree of attention to use effectively.If you can see something you can get to it. There are few if any invisible walls or barriers. Things don't constantly try to kill you as you explore but there are dangerous areas and hazards to surprise you and keep you alert. There's just about enough information in the rather good tutorial to prevent frustration but after that it's mostly down to you. Progress by experimentation, trial and error or blind luck as you prefer. For a couple of hours I jetpacked around with no better plan than to open up the map. Firefall has a very slick map interface and it uses that system that I love in MMOs, where you have a large, blacked-out map that fills in only as you travel. 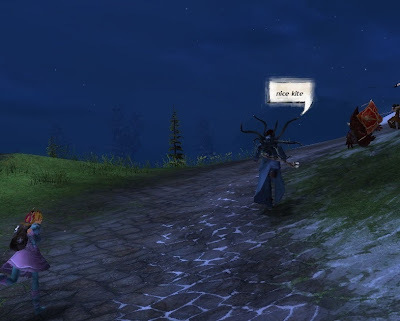 You also get an NPC partner who makes brief suggestions in delightfully accented tones across a crackly coms-link, something I found remarkably involving. At her mild urging I made it a priority to sync with each SIN uplink tower as it came in range. Why? Not quite sure. I think it's the equivalent of biding to an Aetheryte in FFXIV, maybe. Anyway, I'm sure there's some good reason for it. Not knowing what that reason is, well, that's kind of the point. Right now it's more about pure research than practical application and in these early stages of exploration there's just so much to discover. A brief glimpse of a Melding Tornado. Arrived right at the end, just in time to loose off a few shots for whatever good that might do - bullets into a whirlwind. 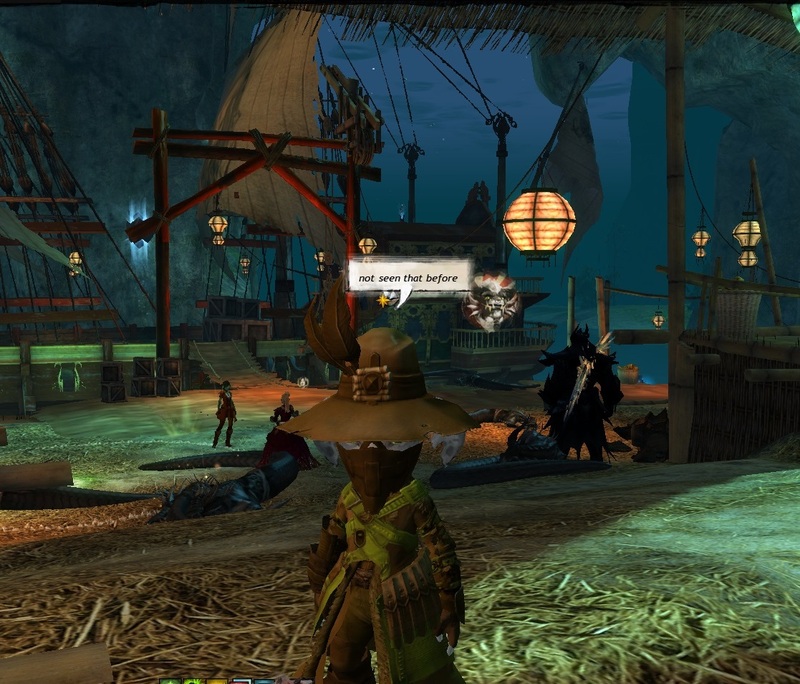 Found and explored Sunken Harbor, a larger and more impressive settlement than Copacabana. Took many screenshots. Armorments. That's a word now? Got challenged to a race by some wannabe Mexican wrestler by the name of El Terremoto, who lent me an LGV that took me about twenty minutes to figure out how to use. Once I worked it out I ignored his challenge and went exploring at high speed until it he lost patience and exploded the bike underneath me. Fun times! Fell down a hole and landed behind a waterfall. Spent a while trying to jetpack out but didn't have enough ooomph. Was wondering whether going through the waterfall would kill me (deep water is instant death in a Battleframe, which makes sense) when I spotted an odd, square panel jutting out of the water. Landing on it boosted me high into the air and, after a couple of wild, flailing, failed attempts, onto a rock high enough to jetpack out. Picked up something off the ground that turned out to be an audio log. Simple idea, very atmospheric. First indication that Firefall has a collect mechanic for Lore similar to The Secret World. Found and explored Shanty Town. Creepy. Very creepy. Especially in the dark, seen by the light of the flashlight that I somehow turned on without ever finding out how I'd done it. Nooo! Don't go in the cellar! This can't go on forever. The more I explore, the more I'll find, the more I find, the more I'll know, the more I know, the more I'll understand. Eventually balance will tip from discovery to use, from how to do things to how to do things better. At that point it may begin to become clear whether Firefall is fun because it's fun or just fun because it's fresh. I note it has all the usual MMO baggage in place and waiting. I found the Achievement panel last night. And the Dailies. But for now, it is fresh, none of the problematic stuff is foregrounded and it feels like a world worth exploring. So that's what I'm going to do. That and take a ridiculous amount of screenshots, because, hey, I've been there! It's the scab you can't stop picking. You know you should leave it alone but it itches so. Jeromai and Ravious both gave it a good old scratch and then came back for more. J3w3l got mad and ripped the plaster right off. The infection is spreading. This week it reached EQ2 although so far it looks like a mild case. The symptoms are familiar - very familiar. Identical, you might say. A checklist of things you were doing anyway pops up invitingly uninvited right there, where it draws the eye. What are you going to do? Ignore it? Easier said than done. We learn a hard lesson in soft power. A push in the direction of momentum. Just a nudge. MMOs were always experiments in social engineering, more or less but the old, crude techniques were easy enough for a wily lab rat to spot. The maze walls had holes, were low, you'd clamber over. The levers tipped rewards that tasted dry. Tastier pellets lay unguarded in the open. Smart rats laughed. Conditioning takes time. Data refines technique. Tools improve. This water feels so warm, so comfortable. Lie back, relax, enjoy it. Now the weekend's here, time enough to get to the meat. Those two and a half thousand survival points aren't going to score themselves. And on and on and round and round and will it ever stop? Do you want it to stop? Aren't you having fun? Doesn't this feel good? You like it, don't you? It's okay, you don't have to pretend. This is what you wanted, isn't it? It's what you said you wanted, don't you remember? Do you even know what you want? Would you know it if you got it? Really, it's so much easier when someone else does the driving. Sit back, relax, enjoy the view. Be a passenger for a while. Were there Election monitors observing the current shenanigans in Labyrinthine Cliffs they'd probably all have given up in despair and gone home by now. Or possibly they'd just be standing around wondering what the heck they were doing there in the first place. Real election to follow. Possibly. It's not even clear to me whether this is an election, let alone the election. Oh, sure, we know there's a vacant place on the council and there are only two candidates, the passive-aggressive, submissive yet authoritarian "Captain" Ellen Kiel and the sneaky, smug libertarian fat-cat Evon Gnashblade, but what's going on right now seems to be a popularity contest to decide who gets to sign a trade deal with the Zephyrites, not any kind of binding election to the Captain's Council. What passes for logic among the Zephyrites doesn't bear thinking about. Their whole society seems to be modeled on some kind of 1960s hippy commune, albeit one that really could have levitated The Pentagon. Their guiding principle might as well be "it seemed like a good idea at the time" and their version of the Great Society certainly doesn't cleave to any ideal of "one man, one vote" (make that "one sentient, any gender, one vote"). Hah! Good luck with that, whiskers! Voting slips turn up all over the place. Stuff your pockets then stuff the ballot. Every vote counts so make sure you use them all. If you can't find enough, just buy some! There's a guy standing right next to the voting boxes hawking them for fourteen silver pieces each or ten for a gold and he has an unlimited supply. This Rotten Borough Recreation Event runs a couple of weeks. Just think how many hundreds, no, thousands of votes you could cast! Then one of the candidates is going to sign a trade agreement with this bunch of mystical folksingers just as they wave goodbye for some new Woodstock Nation of the Sky, leaving us with no-one to trade with. How does that work again? I'm confused, although no more than I have been throughout the entire Living Story. Oh what the hell, let's just go with it. You know it makes no sense! 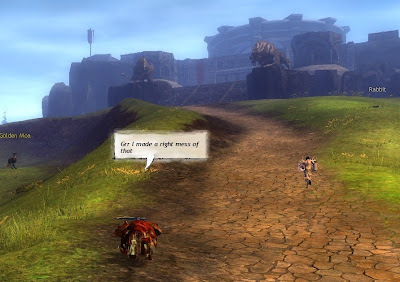 What do people do when they hit the level cap in GW2? Wait! Don't tell me, don't tell me - I know this one! I should do, at least. It's hardly a novelty. I have the full set now, all eight classes. The guardian crossed the finishing line this weekend, just behind the spare ranger, the two of them running neck and neck most of the way. That makes nine Level 80s so far. It's at this point that I usually start to think about getting them into something more suitable than the random grab-bag of yellows and greens they leveled up in, some of which really should have been upgraded weeks ago. The first time at the cap, way back last autumn, the whole process took a couple of weeks - planning, scrimping, saving, hustling up Ectoplasm, hunting down bones. Arrangements were made, crafters enlisted, decisions worried over at inordinate length as though they really mattered. Earlier this year it was still taking most of a weekend. Yesterday it took less than half an hour. Although the guardian's a 400-skill Armorsmith and the craft bank overflows with ectos, a quick glance at values and costs put paid to any idea he might have had of making his own Exotics. Not with 2000 Badges of Honor, mostly from the achievement backlog, taking up valuable inventory space, more than enough to pay for six pieces of Berserker's Chainmail from the Armor Master in Yak's Bend Citadel and a Berserker's Greatsword from the Weapon Master standing next to her. A few rings and accessories out of the guild bank, one or two odds and ends from the Trading Post - job done. It'll go the same way for the new ranger later on today. Level cap to full exotics in minutes. Yes, there's Ascended gear for some slots, with crafted Ascended, which will presumably cover the rest, waiting in the wings. That's enough time-gating to keep someone busy for a good long while, but to what end? 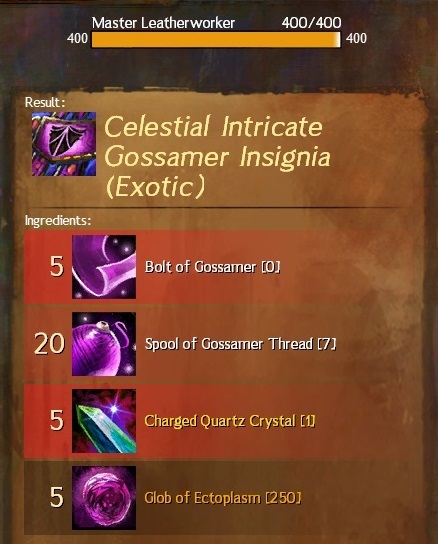 Is there anything at all in the game that requires Ascended gear other than as a container for Infusions, and do Infusions have any purpose other than to allow you to do the same content again only with bigger numbers? No, for any foreseeable purpose, Exotics should be more than enough, Exploring, world events, crafting, Living Story, WvW, that's what my characters do while they level up and that's what they go on doing at the cap. 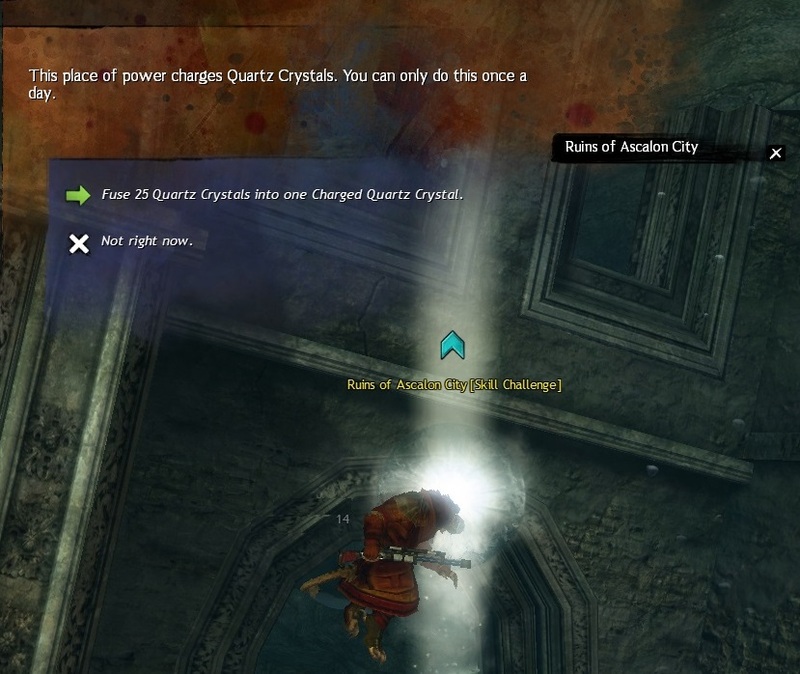 ANet claimed it would work that way and by and large it does. Given the lock on expansions there's really no reason that situation can't persist indefinitely. Having all eight classes to choose from my preference is the same as it was from the very first beta weekend: Ranger. Widely reckoned to be the weakest, considered broken by those who don't play it and most in need of fixing by many who do, still there seem to be more rangers running around Tyria than any other two classes added together. Currently my go-to class for both open-world PvE and WvW, I understand I won't be getting many dungeon invites but hey, that's probably a bonus! A couple of weeks back a bunch of us were teaching the grawl to keep their thieving monkey paws off Tor the Tall's merchandise, a lesson they're exceedingly slow to learn, when an owl made the mistake dumb critters often do and got himself between my greatsword and the grawl I was swinging it at. Flurry of feathers, dead owl; so much nothing new. Only there was the owl, dead in the snow, sparkling. In these lands glitter means gold, or if not gold exactly then at least something worth picking up and putting in your pack. Little critters like this never have anything that glitters. Something strange about this owl. There's a trigger-happy asura I know who likes to use small animals for target practice so I mentioned it to him. In all his considerable bird and bunny murdering experience he'd never come across anything like it either. Being asura he couldn't leave it that. He had to go investigate. From what he tells me, it seems there's a kind of Snow Owl that lives in one very specific part of Wayfarer Foothills, right around Hunter's Lake. 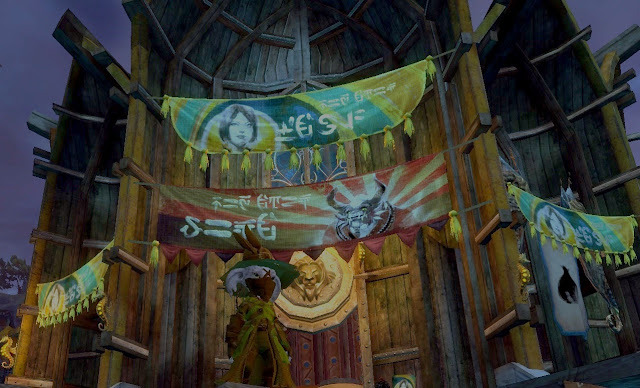 The way my asura friend classifies these things, this owl is a "Yellow Name" where all the other owls he ever found were "White Names". 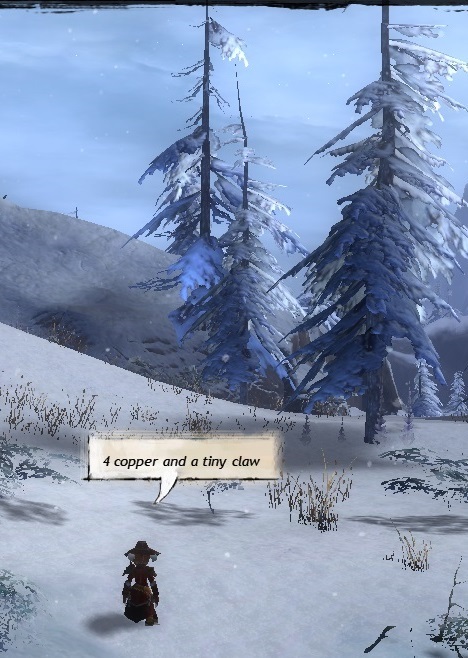 White-named creatures are the feeblest things you'll ever meet in Tyria, things like chickens, rabbits and rats. They're completely harmless, incredibly easy to kill and they never, ever leave a glittering corpse. Killing them teaches you nothing, which is why I leave them alone unless there's a bounty. Yellow-named creatures mind their own business; you leave them alone, they 'll leave you alone but if you happen to shoot or stab one, intentionally or by accident, you'll have a fight on your hands. You can sharpen your skills fighting this kind of animal. Win the fight and there might be even be something left you can use or sell; a pelt or a claw or a chunk of meat. 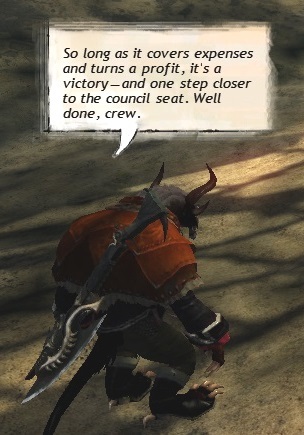 My asuran friend fancies himself something of a tracker although really he's about as subtle as a Dolyak in a pastry shop. Still even he can follow a slow-gliding owl in broad daylight. He tracked this one for a good while, making notes the way the asura do. The bird flies a repeating pattern from just behind Kevach's Lodge heading south-east over the frozen lake through the stand of trees in front of Krennak's Homestead, reaching the end of its range at the end of the wood, looking out towards the Icesteppes. In the name of science (and in no way because he's a bloodthirsty little maniac) he killed a number of these owls (or possibly the same magically reincarnated owl a number of times, he was evasive on that point). 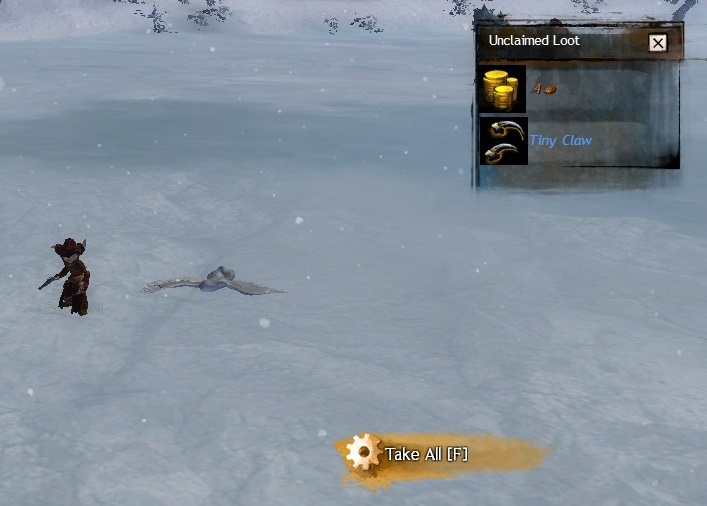 He found that the owl always died on the first shot, that he was able to learn something to improve his skills from each kill and that occasionally the bird would leave something behind, a tiny claw useful for crafting, poultry meat fit to cook or a mangled talon worth a copper or two to a merchant. Just once the owl dropped four copper pieces, something my friend couldn't recall seeing a yellow-named animal do before, nor indeed after, when he conducted a lengthy cull of deer and dolyaks in the nearby area. How an owl obtained or indeed carried the coins remains a mystery. Tyria, of course, is a land filled with mysteries, of which this might well be the smallest and least important. As my asuran friend says, however, pure research is its own reward. I just hope he doesn't come to regret it. 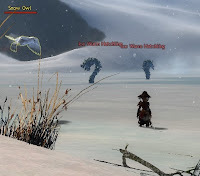 They say the Spirit of Owl died fighting Jormag, but who really knows what death means for an entity like that? It's been a long, hard slog, a dozen or so half-hour, late-night sessions, some set-backs, some triumphs, some embarrassments, but last night my Goblin Channeler finally made it to Meluan's Gate, City of Steam's third quest hub. We both felt we'd passed quite an examination by the time she stumbled into the spectacularly gorgeous, somewhat down-at-heel dockside district of The Nexus. In better days she'd have been able to wander up at will but the freedoms we once enjoyed have been taken away. Now, we work. To move from one area to the next it's necessary to complete all the steps of the Main Quest sequence and that takes a deal of soloing. By and large it's been easy for both my characters to solo content up to three levels above them, but the final bosses of each Main Story chapter have clearly been tuned in the expectation you'll bring friends or at least compliant strangers with whom you've established a working relationship. Fine in theory; in practice I found it was rare even to see another player in Heartlands Road, unheard of for the LFG-Finder that comes as standard with the entrance to each dungeon to find anyone at all. We'd done all bar the Corsair Captain but we weren't going anywhere without him and to have a chance we'd had to pootle around for a fair old while leveling and gearing up.Our first two or three attempts ended fairly disastrously even at parity and we were resigned to over-leveling, when by luck my Goblin discovered the Captain might be a whizz with a tiller in his hand but was all at sea running through the rooms of his lair. Can't recall ever employing room-to-room kiting tactics before but we soon got the hang of it once the Goblin noticed that the Captain didn't regenerate health when he couldn't find her, while she could drink potions at leisure hiding in a room just down the corridor. This cheesy tactic scored a pass grade on the Main Questline topic but that was but the first paper on the exam. It wouldn't have done any good whatsoever to get a group and finish the quests a couple or three levels earlier even if that had been a realistic option because Heartland Vale, the wilderness area that separates Heartland Road from Meluan's Gate, has an 18 certificate and the guard outside is much stricter on seeing I.D. than the average multiplex clerk. We pass, though, don't we? The Goblin's eighteen like Alice and she killed the Captain. She can go through, right? Well, technically, yes. But then again, not really. Through to the Vale, sure. 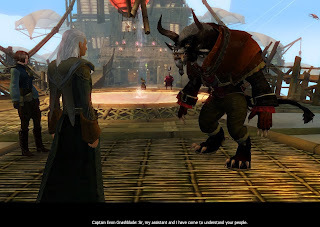 Out the other side to Meluan's Gate? Not so fast. The guard has a list of rogue clockworks blocking traffic and he needs a candidate for the job. She's like Alice you say? Well, good; she just got elected. 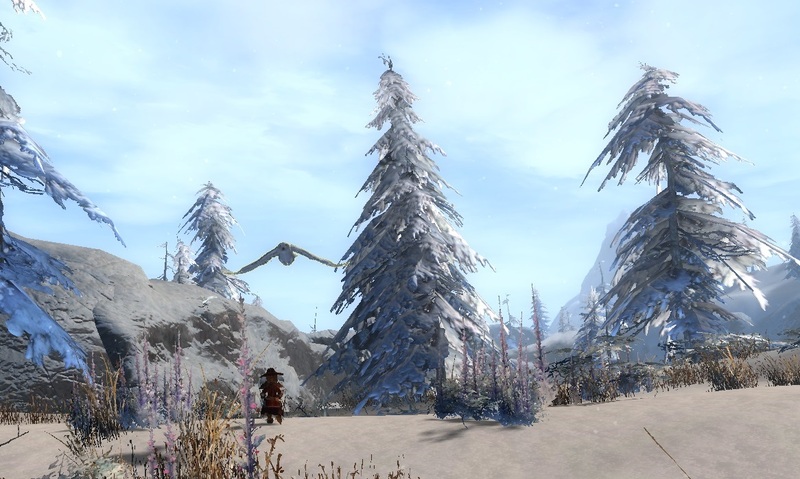 The Wilderness areas are shared space, proper open MMO zones that come in optional PvE and PvP flavors. Maybe the other one has hordes of players zapping each other between clonking clocks, my Goblin wouldn't know. She just wants to get to Meluan's Gate so PvE it is. Some fifty assorted but specific brass dismantlements later, back to the guard we go and finally, finally he stamps the transit papers and we're done. Well, I thought we were done. After running the clockwork gauntlet and reeling back stunned by the sheer beauty of the long-desired but scarcely-imagined Meluan's Gate, we went exploring. Many photographs were taken, many oohs oohed and aahs aahed until eventually time came to see what there was for us to do. There was nothing. Okay, not quite nothing. 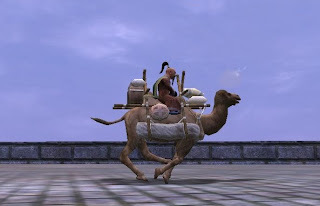 There was that one generic daily that always pops up to give you a free key or potion but other than that it appeared no-one in NPC-land had any pointless make-work on the go, no reckless self-endangerment to encourage, no tedious obligation to offload. We went everywhere, my goblin and I, through the leaf-blown streets, down to the rusted iron docks, to every portal in town. Still nothing. Two nights she slept in the Siren's Dive, wondering what to do. At last I decided it must be the one thing we hadn't done back in Heartland Road. We'd killed the Corsair Captain in the questline but not in his "Raid" incarnation (a CoS Raid ideally being three people but entirely possible solo). Thought that was optional but hey, it was literally the only thing listed under "Completion" that we hadn't ticked and when you've waited this long, what's another ten-minute kite? Back we went. Whereupon we discovered our mistake. On zoning back into Heartland Road something about the guard (mostly the two-foot high green exclamation point he'd balanced on his hat) suggested he hadn't quite finished with us after all. In our eagerness to get out of his jurisdiction we'd somehow missed his last, most urgent request. Would we deliver a letter to his dear old mum over at The Gate, since we were going that way in any case? Well for heaven's sake! Of course we would! If it means we get to kill more creatures and take their stuff we'll write the bloody letter for you and not even tell your mother what an uptight little jobsworth she's got for a son! She probably knows, anyway. So there my Goblin sits, back in the Siren's Dive, having a quick stiffener before the action begins and we do it all over again to get to the next hub. Despite the horrible design decisions, vicious content gating and serious lack of population, I still have plenty of time for City of Steam. It could be so much more but it is what it is and that'll do. Me and the Goblin aren't stopping till the end of the ride. It just might take a while. Massively linked a very interesting item today from the BBC's Science and Environment page. 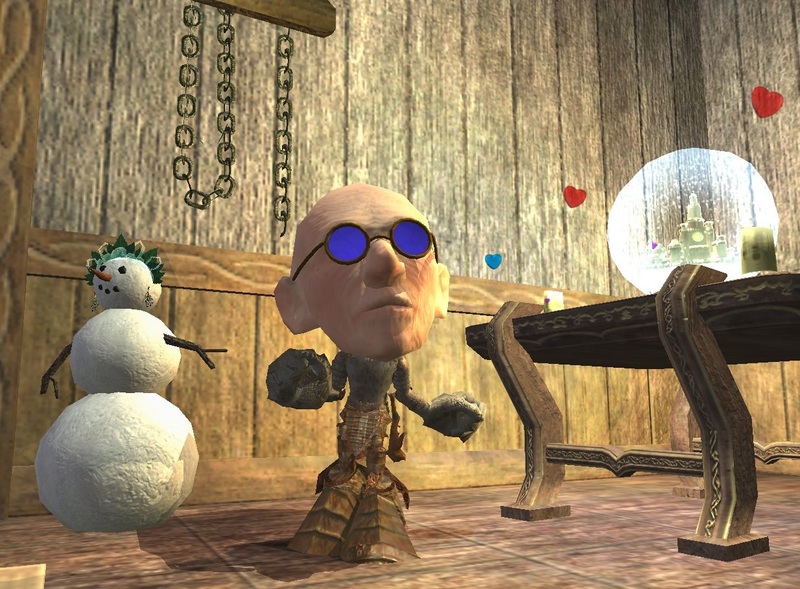 It seems that playing a child-size avatar can give you a childlike perspective on the virtual world you inhabit. The experiment involved motion-capture suits, not something MMOs usually provide even in the Collector's Edition, so any relevance to gaming is inferential at best. All the same, it does tally with my own experience. I strongly prefer to play short characters in MMOs and I would say I behave less like a grown-up when I do. That wasn't what I had in mind when I started rolling short, though. It had nothing to with wanting to relive my childhood. There's another well-noted side-effect of having a perspective closer to the virtual floor and that's a perceived increase in run speed. 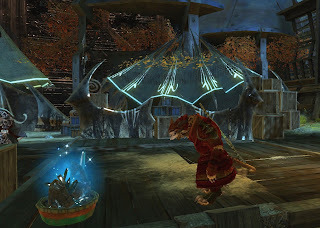 Ogres and gnomes move at exactly the same base speed in Everquest but Ogres feel like they have their feet stuck in Feerrot swamp mud while gnomes zip around like hyperactive mice. Wanting to feel like I had SoW even when no-one was around to cast it on me was what got me riding the short bus back then but once I got on I never wanted to get off. My first choice in a new MMO is almost always a shortie - dwarf, gnome, raki, goblin, ratonga - although I shun the insect-sized sprites and fairies. In character creation I push the height slider almost to the bottom even when playing larger races. That the short races are almost always the most lighthearted, zany or frivolous choice is a welcome bonus. Lantern? Check! Stick? Check? Comedy facial hair? Casting my mind back almost a decade and a half to when I first stepped out into Norrath, comedy wasn't what I came looking for. I can say with complete honesty that I was never one of those people who gave their Ranger some mis-spelled variant of a Tolkeinian archetype for a moniker but I'd be lying if I claimed I didn't have some grim, taciturn woodsman's image at the back of my mind, right up until I fell off Kelethin the first time. About five minutes in, in other words. After that I went for a Dwarf, not least because of the low center of gravity and the ground-level starting area. He had a silly name but he took himself very seriously, just like all dwarves do. That lasted a couple of weeks before he fell in the river in Nektulos Forest and got eaten by piranhas. Never did find his corpse. We'll be the judge of that, shorthouse. It was only when I made a gnome necromancer that things got rolling. Short races really do have more fun. Now I also wonder whether it has something to do with Bartle's famous profile as well. If we feel more childlike in a childlike avatar, does that also enhance our sense of wonder? (It's notable, too, that the experiment found that the avatar had to be childlike as well as childsize - a scaled-down adult avatar didn't encourage the same childlike mindset). And if so, wouldn't explorers prefer to be short? All the focus on Achievements and the confusion that brought with it made me question my Explorer credentials so I went and took the test again over at Gamer DNA. I tried to be brutally honest this time, not always easy with many questions offering two choices both of which I would never, ever take in actual play and others offering choices both of which I would take equally happily. I came out Explorer, as I have every time I've ever taken it, this time with Socializer as runner-up and Achiever in third. As the MMO genre matures there seem to be more childlike avatars than ever. Some, like the Asura, only look like children from a distance, resolving into vicious little leather-skinned aliens when they get up close, by which time it's probably too late. Others, like the Lalafell in FFXIV, resemble dolls of children more than actual children, making it quite the surprise when you find out just how foul-mouthed they all are. Someone always has to take it too far. In the experiment the childlike avatars were asked only to do childlike things, of course. Our childlike characters carry loaded firearms and sharp knives, swear like fishwives, play not just with matches but with flamethrowers and generally act more like psychopaths than pre-schoolers. Whether there could be any carry-over you'd have to doubt. All the same, I feel happier being short. Harder to hit that way, too. Never mind the soul-searching. Bugger Achievements. There was only one reason I spent the entire weekend ticking those sixteen boxes and it wasn't so I could call myself a Bazaar Ambassador (not that a title wouldn't have been nice). It was all to get a really, truly, honest-to-betsy mineable node for my Personal Instance. Ah yes, my Personal Instance. You remember those? All we Tyrians have one. Back in the Dreamtime, before the dawning of the First Beta Weekend, we imagined it might be something like a home, the sort of thing they have in other worlds, a place where you can hang a few pictures, throw down a rug, have a few friends round for a quick game of Belcher's Bluff. 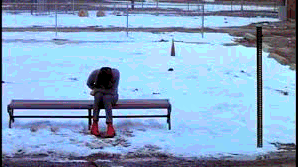 Didn't turn out that way, more's the pity. There are so many Charr milling around in the Hero's Canton in Black Citadel my Ranger has to sleep under a blanket of stars out in Plains of Ashford just to get some peace and quiet. Personal? Hardly! 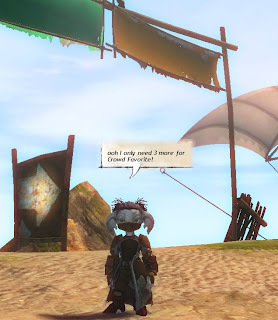 No, Personal Instances in GW2 turned out quite the disappointment. While every other sandpark MMO was running up curtains and laying out paint charts Anet stared fixedly in the other direction, pretending not to notice. After they squashed the possibility of a proper expansion that seemed like the end of any hope for housing, until out of a clear blue sky (literally) came the good skyship Zephyr Sanctum and with it the unthinkable promise of something you might actually be able to place in your house Personal Instance. Rigging was climbed, cliffs were scaled, races were run, baskets were gathered. Many, many silver coins ended up in the coffers of whichever shady crew runs the Waypoint scam service. Finally I had it: my very own Gift of Quartz. Odd phrasing, that. "Delivered to your home instance". I'd imagined placing it myself, somewhere where the light would show it off to its best advantage, a place of honor worthy of the very first permanent, placeable addition to my home. But no, wishful thinking again. Placeability remains but a cub's dream. 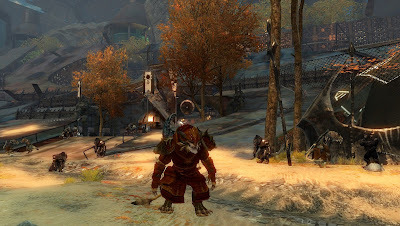 It was going to be delivered and, sadly, not by a Charr in workman's overalls but by magic. Blink and you missed it. No choice where it went, either. Couldn't even find it until I checked the map and saw it had grown a mining node.It sure is pretty. But what's it for, apart from making the place look just that tiniest bit more lived-in? Well, you can mine it once per day per account. It appears in the Personal Instances of all your characters but as soon as any one of them mines it out for the day, that's it. Standard pull, three crystals. I'm guessing, like any node, you can get bonus pulls, the chances for which will increase if your server is grinding the faces of the weak into the dust in World vs World but still, don't count on getting many more than 25-30 crystals a week. 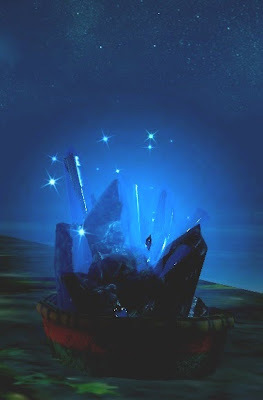 What are they for, these crystals? Luckily I found quite a few recipes as I was grinding adventuring these last few days, so I can answer that. They make Celestial armor and jewellery, which has "all stats". Dulfy has the full info, as always. Having heard some less than enthusiastic comments in Lion's Arch map chat I took the trouble to test the temperature of opinion on this new armor by visiting the official forums. Lukewarm. Which is a shame, because this stuff is going to take some making. 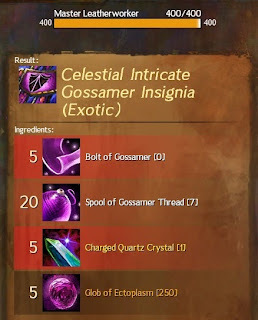 Each piece doesn't just require the usual batch of Ectos, Gossamer and so on; it also needs five Charged Quartz Crystals and each of those eats up 25 of the ordinary kind; 125 in total. How do you charge a crystal? You might well ask. Dozens of people were asking the same in labyrinthine Cliffs yesterday. You go to a Place of Power, that's how, and yes, a lot of people were asking about that, too. A Place of Power is one of those spots where you can Commune. Unsophisticated folk like adventurers call them Skill Points. Go to one of those, use it the way you normally would and even if it's one you've already sucked the energy out of before you get an option to charge your crystals. Now at the moment, naturally, the uncharged crystals are plentiful in the extreme and 125 on the TP would run you a rather trivial 60 silver. In a couple of weeks, though, when the Bazaar closes, the supply will dry up. 25-30 per account per week, remember. It'll take over a month just to collect enough for one piece. Anyone interested in a full set probably should be putting in heavy "buy" orders right now. Or maybe not. Look at Candy Corn. Not been able to get that since last October yet there's still in excess of a quarter of a million corns on the TP. Okay, let's trust the market. Let's assume no shortages or price-gouging. There's still another little obstacle we haven't considered. You can only charge one Charged Quartz Crystal per day per account. And unlike the regular crystals they're account-bound not tradeable. Someone certainly doesn't want this stuff flooding the market, although given the general lack of enthusiasm there probably wasn't much chance of that happening anyway. Not being a min-maxer, I rather like the look of the stats on the Celestial so I'll probably be chipping away at a set. It'll give me something to do over the long winter months, not to mention making a dent in my Ecto mountain.